Peter is an incredible actor, a true gentleman and a passionate animal lover. He took part in Veganuary 2016 and has never looked back. If, like Peter, you’re a fan of rich Mediterranean flavours, then try this beautiful Melanzane. 1. Heat the oven to 200°C/gas mark 6. Heat the oil in a large pan, add the garlic, thyme and sage and cook gently for a few minutes. 2. Add the tomatoes, vinegar and sugar and gently simmer for 20-25 minutes until it has thickened. 3. Meanwhile, heat a frying pan. Brush the aubergine slices on both sides with olive oil, and fry in batches until each slice is softened and slightly charred. 4. 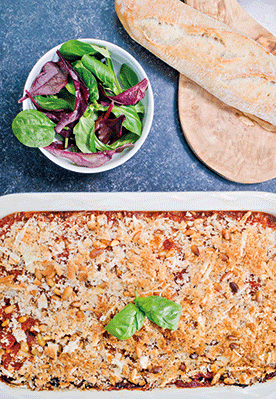 Mix 25g of the grated dairy-free cheese with the breadcrumbs and pine nuts, and set aside. Into a large baking dish, add a little of the tomato sauce and spread over the base. On top of this, add a layer or two of aubergine slices. Season. 5. Spoon over more sauce, then layer some cheese and basil leaves, and then another layer of aubergine. Repeat until you end with a layer of tomato sauce, and top with the breadcrumb mixture. 6. Bake for 30-40 minutes until the top is crisp and golden and the tomato sauce is bubbling away. Rest for 10 minutes and scatter with torn basil leaves.